I’m back from my wonderful week in France feeling refreshed and just a tad sad to be back in the land of wind and rain and a definite shortage on the rose front! We were blessed by good weather and enough sunshine to break out the shorts and sit by the pool soaking up the rays. The blue skies and warmth made wandering round the local markets so much more fun. I couldn’t stop snapping pix of all the vibrant veggies and fruits and loving the casual set up and friendliness of the vendors. My pathetic French made no difference, they still offered information and smiled at my replies. Tastings were offered and purchases made. Shopping at a French market scores a huge 10 over a supermarket minus 1 on the sheer enjoyment scale even before you take the quality of produce into consideration. 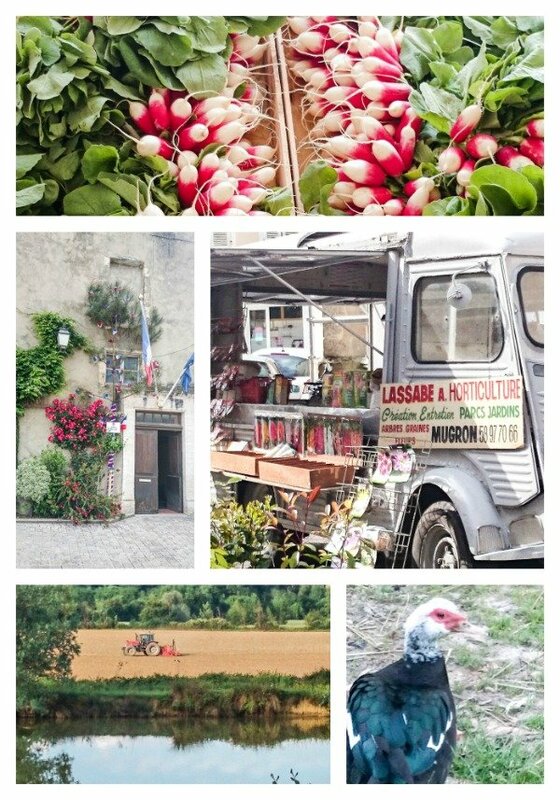 So what could I make for you today that would have just a wee dash of French chic, would be easy to pull together and taste just fabulous – just had to be Pickled Radishes. The humble radish is incredibly popular in France where this easy-to-grow little veggie appears in all manner of dishes and takes pride of place at Apero time served simply with butter and crunchy salt flakes. I used the long style breakfast radishes for my Pickled Radishes recipe, but you can really use any sort you like. There is no need to peel the radishes, just wash them well and then pat them dry on kitchen towel. This recipe will make 1 medium sized jar of Pickled Radishes. Wash and dry the radishes and trim off the stalks/leaves and any root growth. Slice into thin rings using a mandolin if you have one. Using a non reactive pan gently heat the water, vinegar, salt and honey until the salt and honey completely dissolved. Raise to a boil for 5 minutes and then remove from heat. Crush 7 of the peppercorns and add these along with the remaining 3 whole ones to a sterilised jar (see my resources page on how to sterilise jars) and also the garlic clove and the sliced chilli if you are using it. Pack the radish slices into the jar and pour over the hot liquid. Cover and allow to cool before refrigerating. The Pickled Radishes will be ready to eat in 24 hours and will keep in the fridge for up to 3 weeks. Note; the chilli and garlic will keep adding their strong flavour to the pickle, so remove them after 24 hours if you don’t want the brew to get too hot to handle! I love using thes Pickled Radishes just as a snack or as a topper on an open sandwich with some salad greens, goat cheese and ham. They also go beautifully with salmon and chicken dishes. Note; the chilli and garlic will keep adding their strong flavour to the pickle, so remove them after 24 hours if you don't want the brew to get too hot to handle! Is this a long-term preserve? The recipe says it will last for 3 weeks in the fridge, but is that once opened? Just want to know if I can leave the unopened and sealed jars on the shelf for a few months until I get through them. This is sjhort term stuff, store in the fridge and use within 3 weeks.